"It was Saul who pushed me to take my career to another level. "–Johnny Cash on Saul Holiff, his manager for 17 years. 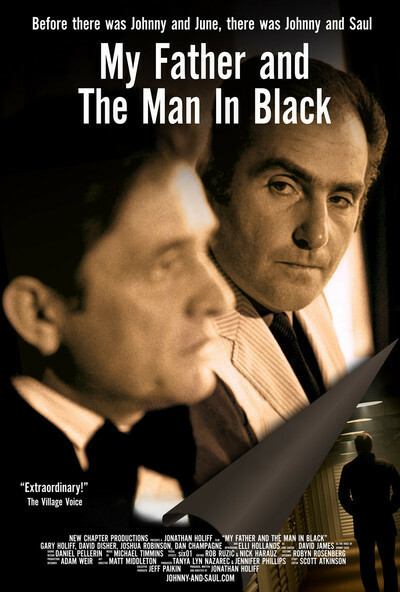 In the opening scenes of "My Father and the Man in Black," an alternately frustrating and powerful documentary, we see a man calmly and methodically committing suicide via pills and alcohol, with black-and-white footage of a giant audience green-screened behind him, and an announcer's voice telling the crowd that Johnny Cash will not be performing that night and they can see "Saul Holiff" in the lobby to ask for refunds. The man committing suicide is Saul Holiff, Johnny Cash's ex-manager (they had severed professional ties in 1973). Although Holiff's death was noted in the press, especially the music press, the fact that it was a suicide was kept under wraps, or mentioned only obliquely. "My Father and the Man in Black," directed by Jonathan Holiff, Saul's estranged son, is both a portrait of a successful and challenging business partnership between Saul and Johnny, as well as a son's search for understanding of his own father. When Saul Holiff decided to end his life, he did not leave a note. In Jonathan Holiff's search to find out more about his father, he discovers a treasure trove in a storage locker, maintained by Saul Holiff for many years. Inside, are scrapbooks, memorabilia, framed gold records, and boxes and boxes of his father's "audio diary," something his son had never heard of or listened to. Late at night, in hotel rooms across the country (and the world), managing Cash's career, Holiff would pour out his thoughts and concerns into a microphone. Many of his thoughts were about Johnny Cash, of course, but not all of them. He talks about his weight gain, he talks about how he knows he's not a good father, he worries about things obsessively. Holiff emerges here as a lonely and somewhat tormented man, wildly successful in his chosen field, but dogged by self-doubt and self-loathing. Listening to this audio diary is a revelation to his son, who only knew his father as the man who was never home. Saul Holiff managed Johnny Cash's career during its most turbulent era, the 1960s and 1970s. These were the years of pill-popping, canceled shows, forest fires, and arrests. They were also the years of "Johnny Cash at Folsom Prison," his own television show on ABC, being born again to Christianity, drug detox, and his marriage to June Carter. Holiff came in about a decade after Cash got his start at Sun Records and the Louisiana Hayride radio show, broadcast out of Shreveport, Louisiana. Holiff grew up in London, Ontario, a high school dropout, addicted to gambling at a very young age. It was a tough upbringing, but Holiff had spirit and ambition. Through his early years, with different businesses, he found he had a knack for promotion. To use promotional speak, he thought outside the box. This was also true of Elvis Presley's manager, Tom Parker ("the Colonel"), who very quickly realized that the possibilities for mainstream superstardom were much larger than anyone had anticipated for these rockabilly greasy-haired boys from the South. Saul Holiff modeled himself in many ways after the Colonel, getting top dollar for Cash's appearances wherever he played, and bombarding the press with innovative and omnipresent promotional notices. Saul Holiff was a pioneer in PR. "My Father and the Man in Black" walks us through this journey, with original footage of Johnny Cash in his television appearances and concerts. The correspondence between Saul and Cash was lively, jokey, with a mix of professional distance and intimacy. Cash addressed one letter to Saul with, "Dear Mr. Volatile…" In the dark years of the 1960s, when Cash was canceling shows left and right, or giving poor performances with a blown-out voice, Saul had to play damage control. He was sued by venues for Cash's no-shows. His audio diary tells the story: "Johnny in no shape to play shows. June powerless to intercede." "We were concerned whether or not Johnny was going to make it." Managing a superstar is a thankless job, in many ways, although the money is good and you get to travel. When Johnny Cash published his autobiography (long after he and Saul had parted ways), he sent a copy to Saul with a note written inside, saying that Saul's place in his story was much larger than what was reflected in the pages of the book. Johnny Cash's rebirth experience, finding Christ, impacted his life as well as his career. Cash's passion project was "The Gospel Road," a film about the life of Christ. Cash could find no one to finance it, so he ended up producing himself. And Cash cast his manager as Caiaphas, the Jewish high priest who allegedly sold out Jesus. Jonathan Holiff watches his father in the film, resplendent in red and white robes (an absurd image), and wonders what his Jewish father thought of all of this. Holiff also recorded his phone conversations with Cash, and one of the most fascinating ones has to do with "The Gospel Road". Holiff tries to tell Cash that people are not really into being preached to like that, but if this is what Cash wants to do, then Holiff will find a way to make it happen. Holiff says to Cash at one point, "I think you're used to people telling you what you want to hear," and Cash says, "Yeah. I don't want that." It's a riveting glimpse of the relationship. Saul Holiff talks to his audio diary about the growing tension between him and Johnny and June. Finally, after a blow-out with the couple, who felt he was trying to squelch their religious fervor, he quit. Nobody believed he quit. Nobody quits managing a star of Cash's magnitude. He had to have been fired. But no. Saul Holiff walked away, and enrolled in college in Canada, getting a degree in history. The audio diary tells a sad story, one that Jonathan Holiff shares with us, narrating his reactions to it, sometimes looking right at the camera. His father was never around, and when he was around, he was distracted or distant. His father's suicide left these issues unresolved. But Jonathan Holiff finds some peace with all of it through listening to the inner workings of his father's mind. This has the potential to be dreadfully maudlin stuff, but the film is too damn interesting to be maudlin. Much of the film is told via re-enactments, with actors playing Saul Holiff, June Carter, Johnny Cash, re-creating the events described by Holiff into his audio diary. It is sometimes an awkward and distracting choice. Seeing an actor who looks more like Ric Ocasek than Johnny Cash, pretending to be high on stage as an actor playing Saul and an actress playing June look on horrified doesn't add much to our understanding of the event. It leads us away from the deeper truths inherent in the material. Re-enactments don't have to be a negative thing. Sarah Polley used them in a wonderfully effective way in "Stories We Tell," where the mystery of her mother's past is put together in pieces remembered by multiple people, and minimal re-enactments were used in "Elvis: That's the Way It Is," the posthumous documentary about Presley. It is clear that Jonathan Holiff is attempting the same thing in "My Father and the Man in Black". He never tossed a ball around with his father. Now, years later, after his dad's death, he hears his father saying again and again on those tapes that he so would love to "toss a ball around" with his sons, but something holds him back. In such a revelation, one can find forgiveness, empathy. That's what the film is all about.